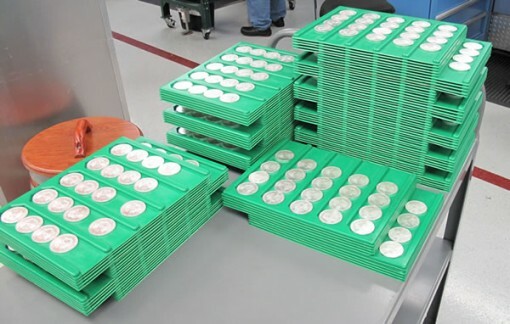 Inventories of newly struck 2013 American Eagle silver bullion coins are exhausted after United States Mint authorized dealers ordered 6,007,000 in less than two weeks. Sales came to an unexpected end Thursday for the one-ounce, 99.9% pure silver coins. The U.S. Mint implemented a sales suspension that, it says, will continue until inventories build up to support at least rationed buying. The Mint’s target date to resume ordering on an allocated basis is on or about the week of Jan. 28, 2013. 2013-dated American Eagle silver bullion coins launched on Jan. 7, 2013. Opening sales hit 3,937,000 for a one-day record that spans through the Silver Eagle’s 27-year history. Pent-up demand boosted the numbers as the 2012-dated bullion coins sold out on Dec. 19, leaving distributors without new supplies for three weeks. Additionally, demand is historically higher for newly dated American Eagles immediately following release. Though minted for investors as an option to add physical silver to their holdings, collectors join in with early year purchases for their collections. They tend to place varying orders with dealers, sometimes for 20-coin rolls filled with American Silver Eagles from each U.S. Mint facility that strikes them — the West Point Mint and more recently the San Francisco Mint. The U.S. Mint in the latter part of the Great Recession faced similar Silver Eagle shortages and implemented suspensions as uncertainties drove safe-haven bullion demand to unprecedented levels. Along with improving manufacturing techniques and shoring up sources of coin blanks — the precious metal discs used in minting coins, the San Francisco Mint in 2011 began striking bullion Silver Eagles to augment inventories. Until this latest suspension, Silver Eagle sales were tracking to thrash the all-time monthly record of 6,422,000 coins set in January 2011. Current sales rank third highest for a month, with second place belonging to January 2012 and its sales of 6,107,000. Still, this month is likely to hurdle to the top as long as Eagle sales resume on or close to the 28th. From there and barring safe-haven economic news, demand is likely to retreat based on trends. Most recently, sales in February dropped to 1,490,000 for the weakest monthly showing of 2012. That, after January’s 6.1+ million surge. 2012 annual sales of 33,742,500 bullion coins stand third highest with 2011 the leader at 39,868,500 and 2010 following at 34,662,500. Bullion coins do not carry a mint mark denoting their production origin. Next week, on Jan. 24, 2013, the U.S. Mint will offer this year’s first collectible American Silver Eagle. From West Point, in proof quality and bearing the denoting "W" mint mark, it will be available on the U.S. Mint website (www.usmint.gov/catalog) for $62.95. So the US Mint can not keep up with investor demand & ETF’s like SLV & Sprott Physical Trust have record inflows of physical silver and somehow the price continues it’s 2 year downtrend. Something doesn’t add up. How can the price of a commodity keep going down with tight supply & exploding demand??? Better get all the silver while you can cause when true supply demand catches up the price is going to treble. Do not forget that record mintages eventually catch up with high initial demand. Higher prices now will eventually fall to less than $100 for an MS70 (as record mintages continue). So wait a bit before purchasing this one from a dealer. Do not forget that demand for silver brings out the most anonymous of deposits and vein by-products. in other words do not hold your collective breaths. Paper silver abundant. Physical silver not. And Germany has to wait 7 years to get back a portion of their gold from the Fed. Something smells real fishy. I agree with Ted Butler and have been reading his commentary since ag was around $5/oz. Sooner or later JPM will lose control of the silver market. Trust will be in physical, not paper. It’s already starting with gold now. just got e-mail from mint saying 2013 silver proof eagle subscription is delayed also. And can the 5 oz. SP Hawaii actually be sold out as indicated w/ last sales # under 15000? If so can’t wait to get final mintages on all 5 of the 2012 series. Not so fast!! That sold out 5 oz. SP Hawaii may just show up in the May/June American Eagle West Point Two-Coin Silver Set. Just when you think you got them figured out…then they leave you in the dust. I cannot see the mint putting a 2012 coin in a 2013 set. Tend to think that somehow they are misinforming us however. This article states “2013 American Eagle silver bullion coins are exhausted”. These are bullion coins that are not available by the public direcly from the mint and only from United States Mint authorized dealers. There must be a large anticipated demand for silver coins this year. Or is it a jump in silver prices? Still plenty of good deals for 2013 American Eagle Silver Bullion coins. The dealers have not exhausted the 6,007.000 as of now. I have had no trouble getting them at the local coin shop for $4 over spot. Can’t be that much of a shortage if I can walk into the shop everyday and buy 10, which I have been doing for over a month.